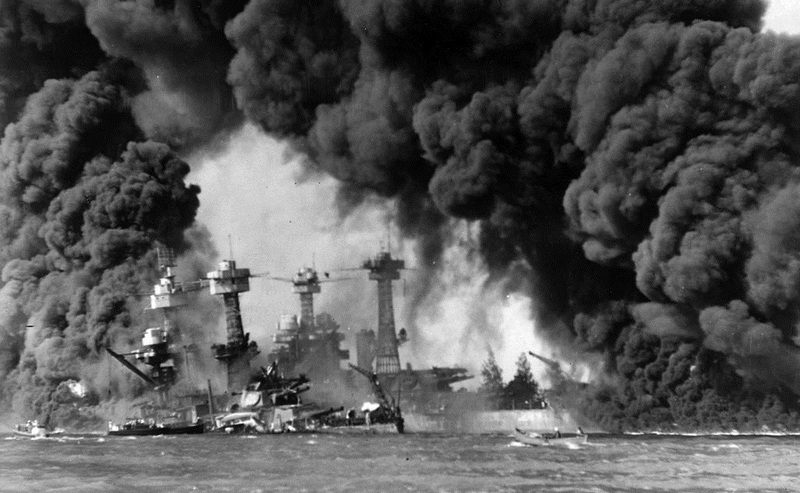 The U.S. Navy battleships USS West Virginia (sunken at left) and USS Tennessee shrouded in smoke following the Japanese air raid on Pearl Harbor. (National Archives and Records Administration, via Wikimedia Commons). It is not difficult to understand why Jewish people desire the overthrow of Nazi Germany. The persecution they suffered in Germany would be sufficient to make bitter enemies of any race. No person with a sense of the dignity of mankind can condone the persecution the Jewish race suffered in Germany. . . . Instead of agitating for war the Jewish groups in this country should be opposing it in every possible way, for they will be among the first to feel its consequences. Tolerance is a virtue that depends upon peace and strength. History shows that it cannot survive war and devastation. A few farsighted Jewish people realize this and stand opposed to intervention. But the majority still do not. Their greatest danger to this country lies in their large ownership and influence in our motion pictures, our press, our radio, and our government. Lindbergh’s speech was universally attacked by the media and politicians. The White House issued a statement noting the similarities between Lindbergh’s language and “the outpourings of Berlin in the last few days”; the 1940 Republican presidential candidate, Wendell Willkie, called it “the most un-American talk made in my time by any person of national reputation”; the Des Moines Register thundered “that it disqualifies Lindbergh from any pretensions of leadership”; and the Texas legislature passing a resolution demanding that Lindbergh stay away from the state. Several prominent members of America First abandoned the organization, and others defected to the competing Keep America Out of the War Committee. When they first heard of the speech, members of America First’s executive committee were initially alarmed, although they ultimately voted 10 to 1 to continue to support him and issued a statement defending their popular speaker and deploring “the injection of the race issue into the discussion of war or peace. It is the interventionists who have done this.” Various far right organizations expressed their support, and the anti-Semitic newspaper affiliated with Father Charles Coughlin’s radio program applauded the speech. Above all, Lindbergh remained immensely popular with the membership, and his rallies continued to attract huge crowds, including 20,000 in Madison Square Garden on October 30. In November the America First Committee began a new line of attack, questioning the Roosevelt administration’s “sabre-rattling with Japan.” And then, on the morning of December 7, 1941, Japanese forces attacked Pearl Harbor. Hours after the attack, an America First rally was held in Pittsburgh, and Robert Hagy was there to cover it for the Post Gazette. Among the speakers was the famous dancer Irene Castle McLaughlin, who—with her first husband, Vernon, an Englishman killed during the First World War—had launched an American dance craze and whose life story had been the subject of a recent Fred Astaire and Ginger Rogers film. Other speakers included local politicians and the organization’s leaders. As word began to trickle in about the attacks, the rally took on the surreal aspect that Hagy captures in the following report. Four days later, the national leadership of America First agreed to dissolve its operations. Notes: When the rally’s leaders first hear of the attacks in Hawaii, they immediately recall the Greer incident. On September 4, the American destroyer Greer was carrying mail to American troops in Iceland when a British aircraft alerted it to the presence of a German U-boat. In response, the Greer used sonar to report the U-boat’s position to the British aircraft, which attacked the U-boat with depth charges. The Germans fired a torpedo at the Greer, and the destroyer then joined the battle by launching its own depth charges. 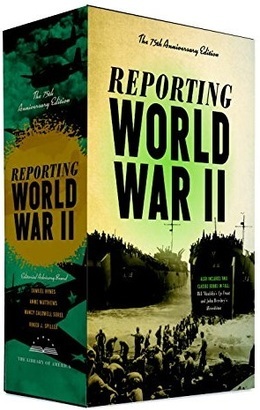 When Roosevelt first reported the incident a week later in his radio address he didn’t mention the existence of the British aircraft and accused the Germans of having “fired first,” but the British involvement was revealed to the public a month later during congressional hearings. One of the speakers mentions “50 ships” the president had “given away,” a reference to fifty destroyers Roosevelt sent to Britain in September 1940, in exchange for the right to use British bases in the Western Hemisphere. The strangest development here involved America Firsters assembled in Soldiers’ and Sailors’ Memorial Hall in Oakland Civic Center, three miles from downtown Pittsburgh. . . . If you don't see the full selection below, click here (PDF) or click here (Google Docs) to read it—free!